If you receive messages from Twitter via SMS and frequently use the Messaging app to reply to and/or retweet them, you may be interested in this patch. It adds 'Retweet', 'Reply', and 'Leave' items to the context menu that shows up when you click on a message. 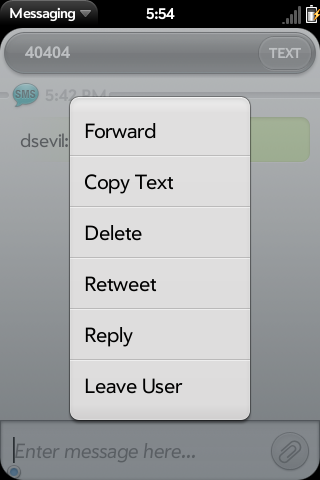 None of these commands send your message right away; this allows you to check and edit the message before sending it. For this patch to work, your contact *must* be named 'Twitter' (case-insensitive). Should also work with shortcode 40404.